Fl1953, Bartonella or Lyme's Biofilm? Recently, Dr. Zhou has reminded us of a special process that is involved in the formation of dangerous biofilms. Basically, many bacteria have a "chatty" way of talking to other cells such as other bacteria. So bacteria use chemicals to cause other bacteria to make chemicals, release them and to detect them. Eugenol is the major component of clove extract. It disrupts this chemical communication of bacteria which it typically used to help the bacteria survive. It was so effective that at very low amounts it still disrupted bacteria chemical communication. Further, Eugenol at low doses, called "sub-inhibitory concentrations" inhibited biofilm formation. 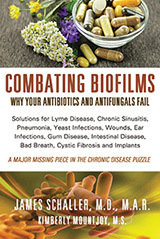 Essential Oils can not be used as biofilm treatments casually for Lyme's Biofilm, FL1953 or Protomyxzoa Rheumatica. When an herbalist or aroma therapy or essential oil expert says these have no side effects—run. It means that they have not read the immense body of publications about the side effects from things like essential oils and herbs. Heracleum Sosnowskyi was discovered in 1772 and has a number of ways it can harm humans. For example, sunlight creates a "photoallergic" response, in part due to the intensely toxic furanocoumarin in its sap. Furanocoumarins are found in the leaves and stem and are the components of the essential oil. They may penetrate the skin through the epithelial layer, posing a direct threat to human health. Contact may cause large blisters and burn sensations. If taken orally it causes farm animals and most likely also humans to experience internal bleeding. Clove bud oil or eugenol is typically tolerated, but if too much is used medically or if you re-exposed to it in many ways in high amounts it can be toxic. For example, does your functional medicine healer know the best dose for you? First, a healer should know it is already in a vast number of products in these areas: medications, perfumes, flavorings, agricultural chemicals and cosmetics. Kamatou reminds us its medicinal uses include as an antibiotic, anti-inflammatory, pain killer, and both an anti-oxidant and anticancer activities. It is used profoundly in protecting food from micro-organisms during storage, and is also used as a pesticide and fumigant. Simply, a healer cannot assume the only exposure to clove bud oil or eugenol is the dose the healer is prescribing. Further, the processing of the oil by each person will vary. Some will need to be given their dose in unfamiliar ways such as drops placed into a small 4 or 0 capsule, or both so the 4 size fits into the 0 size. Also, some need to take this powerful oil with marshmallow root as the gut protecting herb, so the capsule looks like wet thick green/brown powder. Achillea ligustica essential oils are believed to be able to kill a number of bacteria, including ones likely to have biofilms. In a head to head study Cecchini compared Listerine® and clove oil (containing 89% eugenol). The most susceptible microorganisms were Bacillus cereus, Streptococcus pyogenes, and Candida albicans. Listerine® did not exert a strong inhibition on bacteria microbial strains tested. However, its effectiveness increased significantly when essential oil was added. The study provides additional evidence for the in vitro inhibitory activity of A. ligustica essential oils on several pathogens. It is suggested they may be useful in mouth rinse formulations to limit oral infections.